You’ve probably heard it mentioned a couple of times. Or if you’re a fan of the underwater world, or better yet, dive or snorkle every now and then, you’ve probably added swimming with this adorable-looking, slow-moving creature to your bucket list. The Whale shark (hiu paus) has gained immense popularity for its gentle and approachable nature. As they feed almost exclusively on planktons and small sea creatures, they are not known to pose a threat to humans. Its enormous mouth (nearly five feet wide) filters large quantities of tiny plankton that it filters through its gills as it swims. These gentle marine giants roam the oceans around the globe, generally alone, and usually inhabits all tropical and warm-temperate seas, including in the waters of Indonesia. Although its species is considered to be the biggest fish and shark in the world. The largest ever recorded was over 12 meters long and 21 tonnes! But where do you go if you do want to meet them? 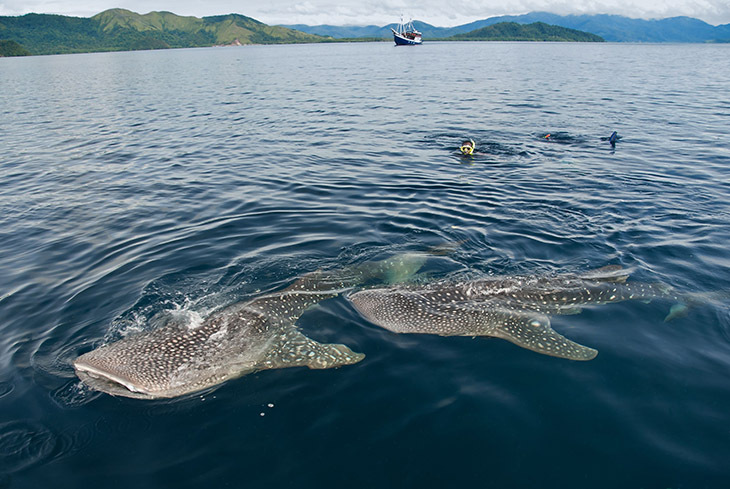 Here we list some spots in Indonesia that whale sharks have been spotted. Located on the north side of West Papua, Cendrawasih Bay is the largest marine national park in Indonesia and also the research and conservation center for whale sharks. 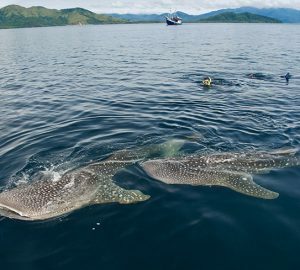 For whale shark sighting, head to Kwantisore village, where whale sharks have been seen emerging to the surface and even interacting with the locals around the 8 bagan , the fishermen’s floating houses’ in the village. This area is actually where the whale sharks are the most accessible. You don’t even have to dive to see them, and you only need to be on the boat, just few meters away from shore. having said that, tourism in this area has gone out of control, with increasing number of tourists every year (many of them not knowing how to properly interact with the whale sharks). The area is great for diving too as it has quite the well-preserved coral reefs and underwater biodiversity. When: December – April. The whale sharks comes out almost every morning. Bentar is the name of a beach in Probolinggo, a city about 2 hours from Surabaya. The water in this area is very murky hence not ideal to dive in, but you can still see them when they emerge to the surface. Derawan Island is an island city that is part of the Derawan Islands, an archipelago in East Kalimantan that also lists the equally popular Maratua, and Kakaban in its area. The area has one of Indonesia’s most amazing underwater life: giant turtles, dolphins, manta rays, dugongs and barracudas, stingless jellyfish and although not as common as the other aforementioned spots, whale sharks. Its rich coral species ranks Derawan only second to Papua’s Raja Ampat Islands in West Papua. We strongly advice for you to have a local guide when you venture out to see these gentle giants. Not because they are dangerous, but because humans can be dangerous for them. Reckless tourism can be a threat to the species as it can interrupt their feeding and sharks can be injured by boat propellers. For more information about Whale Sharks and its conservation in Indonesia, visit whalesharkindonesia.org or their Facebook page.